A famous, or rather, infamous win, this victory by Ronnie Peterson over his team mate Emerson Fittipaldi. When arriving at Monza for the Italian GP Emerson Fittipaldi and Jackie Stewart were head-to-head for 1973 title, Emerson still in with a chance if he could take victory at the Autodromo. And the prerequisites for the Gran Premio were the following: prior to the season Lotus team manager Peter Warr promised joint number one status to Peterson and Fittipaldi. Another part of the agreement said that both drivers would allow each other to win their home GP. Coming to Austria the race before Italy the season had unfolded in a way that Peterson had been the quickest of the two but Fittipaldi had been more consistent (or lucky), thus collecting more points than the Swede. Team Lotus therefore decided that only Fittipaldi had the chance of winning the championship and that Peterson would let Emerson ahead should the situation arise. 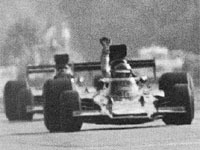 Ronnie duly obeyed to team tactics as he let Fittipaldi through on lap 16, only to be handed back both lead and win when fuel feed problems caused Fittipaldi to retire 6 laps from the end. Prior to Monza now only Cevert and Fittipaldi stood a mathematical chance of taking the title from Stewart. In Emerson's case this meant he had to win all of the remaining three races with Stewart only needing a fourth at Monza. So again Fittipaldi was top man for Lotus and Peterson would have to obey to team orders once more. On Saturday, things looked bright for Lotus, Peterson taking his seventh pole of the season while Fittipaldi was fourth. Then, on race day, Peterson and Fittipaldi took an early one-two lead while Stewart suffered from a puncture early in the race. It looked all over for the Scotsman but he came storming up through the field, finally reaching the all-important fourth place. With the championship all but sealed for Stewart, Colin Chapman decided to let Peterson win after all. On our picture we see Peterson crossing the finish line only yards ahead of Fittipaldi. The Brazilian was furious after the race. Some observers had noted some favouritism towards Peterson during the season and at the time this decision was seen as an confirmation of that. Fittipaldi decided it was time to leave Team Lotus but discussions about the 1974 season continued. Emerson apparently got an acknowledgement from Chapman prior to the Canadian GP that he had been wrong in allowing Peterson to win the Monza race, while the next race at Mosport was also surrounded by much controversy. During the race an torrendous downpour saw the track flooded and with tyre stops and the ensuing pace-car period confusion was all around. Most observers thought Fittipaldi had won but the win was given to Peter Revson. After his problems at Mosport Peterson won the final GP of the year at Watkins Glen. He bagged his ninth pole of the year and his fourth GP win. This was however not a particularly happy win for Peterson because he had lost a good friend during qualifying when Cevert crashed fatally. Late in December 1973 Chapman made a final bid to keep Fittipaldi with the promise of being the uncompromised number one driver but Fittipaldi had enough and signed for McLaren. In hindsight this turned out to be a good move for Emerson went on to win the 1974 World Championship.